Post formats is an optional value added to WordPress posts which allows theme developers to define visual representation of a post. Theme developers can create themes with support for post formats. A number of post formats are available, however it is not possible for themes or plugins to introduce custom post formats. It is not necessary for theme developers to support all post formats. Aside – A note like post, usually styled without title. 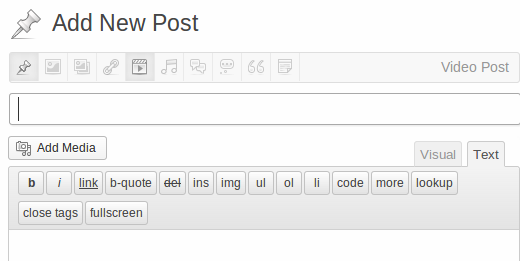 Standard is the default post format in WordPress. It can be an article, a blog post, or anything the user want it to be. A standard post can also be any of the other post formats as well. For example, a standard post can have a gallery or a video. The user can decide whether they want to use their theme’s built in support for the formatting and display of a particular post format or they would rather use the standard post format. Aside is an extra bit of information that a blogger may want to provide to their readers without writing a standard post about it. It could be an external link, reference to a discussion carried out elsewhere on the web, or an interesting piece of information that does not fit in the regular scope of the blog’s posts. Aside in WordPress is one of the supported post formats. Theme developers can choose to provide support for a post format to define its visual representation. The ids are the ids of images in WordPress media, allowing users to easily include images to the gallery. A link post format contains a link to a web location. Ideally it is used when a user just want to share a link instead of writing a post. They can just add a title of the link and the URL or optionally add their own commentary for the link. An image post format in WordPress is used to display a single image or photograph. Quote is one of the post formats supported by WordPress. It is used for quotations, specially when a user wants to just share a quote which is not within a standard post or article. A user may decide to add or to wrap a quote around <blockquote> HTML tag. Status is one of the post formats supported by WordPress. A status is usually a short, twitter-like, status update. However, it is not necessary for an status to be short or twitter-like. A user may choose to write longer status updates. Video is one of the post formats supported by WordPress post formats system. A post in video post format usually contains a video either embedded from a third party video hosting service like YouTube or uploaded and played directly from WordPress. Since WordPress version 3.6 there is support for native video upload and playback. Audio is one of the supported post formats in WordPress post formats system. A post with the audio post type usually contains an audio file embeded from a third party hosting service or uploaded directly through WordPress media uploader. Chat is one of the post formats supported by WordPress. It is used to display a chat transcript.